I checked out the jumbled, zigzagging branches of my Japanese kerria (Kerria japonica) planting the other day, and to my surprise a few random blooms of bright yellow had emerged. Kerria puts its best bloom show forward in late April in northeast Ohio, just after the forsythia fades. But, July, who knew? Not me. I loved this touch of spring, and even more than the opened blossom, the random flower buds were a reminder that kerria is in the Rosaceae; the flower buds certainly remind us of miniature roses. So, that takes care of two seasons. Then there is fall with pretty good fall foliage, mixing yellows with soft browns, and with leaf drop revealing then the green stems that are a great winter feature. 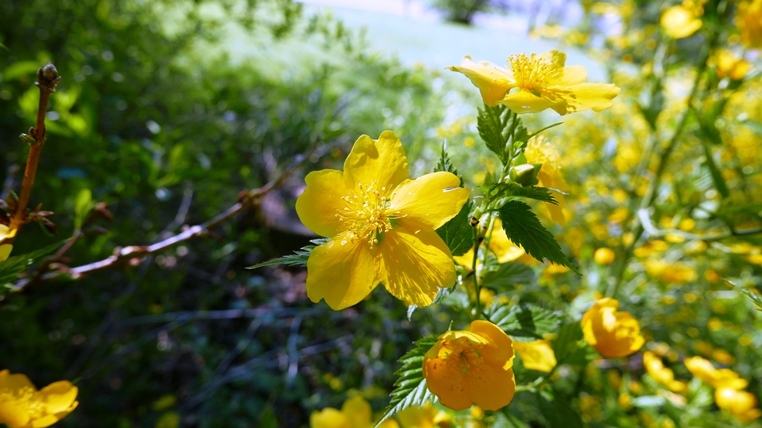 Kerria is named for William Kerr, who introduced the ‘Plenifora’ double-flowered kerria, quite popular, I noticed, when visiting the Beijing Botanic Garden this spring. Like forsythia, named for William Forsyth, giving credence to those pronouncing forsythia as “for-sigh-thee-uh”, I suppose kerria, which I have always pronounced “care –ee- uh”, might just as well be “cur-ee-uh”. Not quite, though fruits and seeds are not common. Suckering and those occasional fruits and seeds make kerria an invasive issue in some areas.